Back in 2009 the Spirit of Mystery made its way to Australia. It came to Melbourne then went on to Sydney to a great reception as major attractions at the Sydney Boat Show in Darling Harbour. 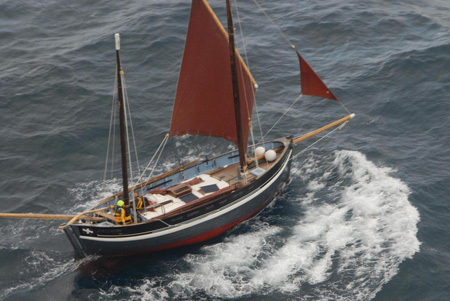 Pete and Andy Goss are now back in the UK in Cornwall. Here are some pictures taken while they were in Melbourne. 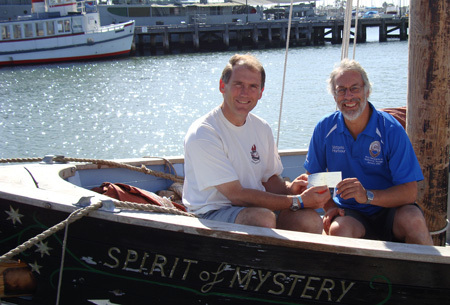 Spirit of Mystery chips in to help local youth; here is Pete handing over a cheque to Peter Harris in support of his passion which is to support youth development through Tall Ships and sail training. The big challenge at the moment is to raise enough money to get the Alma Doepel back up and running.